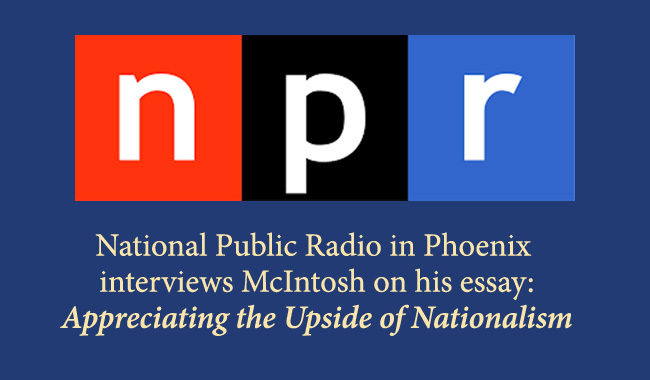 On Wednesday, April 19, NPR Phoenix reporter Steve Goldstein interviewed ICE president Steve McIntosh about his recent essay: Appreciating the Upside of Nationalism. The interview can still be heard online at the radio station’s website: theshow.kjzz.org (to listen press the ‘play’ button on The Show’s April 19th broadcast blue heading bar, then scroll forward to the beginning of the interview at: 10:33). At the end of the interview Goldstein insightfully asks about the role of pride in maintaining positive forms of nationalism. McIntosh responds by pointing out that while progressives have done well to help us atone for America’s past crimes and abuses, it is also very important to recognize the significant good that America has done, and how it remains a beacon of hope for many people worldwide. We invite you to listen to the interview. Re: Steve McIntosh’s essay on nationalism and globalism. I usually find SM’s take on cultural issues enlightening. Not this time. The essay is very disappointing. No definition of ‘nationalism’ or ‘globalism,’ rendering the chart comparing the two just about useless. There is almost nothing positive to say about nationalism, usually understood as an attitude of positive regard towards one’s own nation-state to the exclusion of others. Expressed in a fan’s rooting for a country’s team in the Olympics, nationalism is harmless enough, I suppose. But in any form – moderate to extreme, nationalism is irrational; or as integralists prefer to say, prerational. It is a form of ethnocentrism, by definition narrow and exclusive, too easily given to hostility towards other nations and ethnicities, often tainted by racism and/or religious bias. Nationalism today is particularly irrational since most nation states are multicultural. What exactly is the national identity of a Caucasian citizen of the United States, a Muslim immigrant, a Latino, a Member of the (black) Nation of Islam, a Trump voter who yearns for the return of the Confederacy? National identity is a delusion. If globalism (undefined, recall) means more than global integration of communication and banking systems and regional trade deals – what I call ‘globalization’ – if it means instead a postmodern embrace of the entire planet and its inhabitants as the ultimate locus of ethical concern, then nationalism and globalism are not an “interdependent polarity.” Their relationship is hierarchical, as any integralist of SM’s stature should realize. Globalism in this sense transcends nationalism but, of course, includes it in the way all postmodern phenomena include the modern. That is not interdependence. Nationalism can thrive quite nicely without globalism, as the current upsurge in right-wing populism worldwide demonstrates. But the reverse is not true. Globalism requires nationalism as the earlier stage out of which it has itself developed. It includes by accepting the stage structure of the nation state (LR quadrant) but rejects the exclusionary, ethnocentric psychology (UL) and culture (LL) that it inevitably produces among developing human beings. Thanks for commenting Charles. It’s worth saying that most interdependent polarities consist of a higher level and a lower level. Each one mirrors a “part and whole” motif. So obviously, the whole is on a higher level than the part, just as globalism constitutes a higher level than nationalism. Indeed, this ubiquitous polar pattern in evolution itself mirrors the primordial polarity of infinite and finite. Globalism: the attitude or policy of placing the interests of the entire world above those of individual nations. Nationalism: devotion and loyalty to one’s own country; patriotism.